What was the most difficult obstacle in your marriage during your infertility journey? Because my husband and I wanted a large family, I put a tremendous amount of pressure on myself to have a second baby. I was depressed, anxious, and frantic. It consumed my thoughts, which was a lot for my husband to handle. That is when we decided to seek couples counseling. Do you still keep in touch with your gestational carrier? Yes! I could not imagine not staying in touch with her. We text monthly and she and her family came to the twins baptism and first birthday. Where did the name Angel Wings come from? Through my six year infertility journey, I had many “angels” that God placed in my life to help guide and support me. When I hired a life coach, she asked me to give myself a nickname and it was…Angel Wings. It was profound for me– it helped me to elevate my perspective, transform and transcend the stigma of infertility. Was it weird watching someone else that was pregnant with your babies? Honestly, no. After six years of trying, we were so thankful for this opportunity and felt so blessed. I never had a single minute of jealousy towards her – just sincere appreciation and complete awe! What was the craziest thing that someone said to you about your infertility? What was your most awkward healthcare moment? I was in a gown with my feet in the stirrups, about to have an HSG. When my doctor sat down and lifted up my gown to perform the procedure, he had a horrible minute long coughing attack – right between my legs. Now that was awk-ward! S.J. 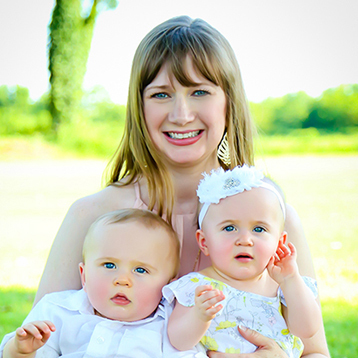 O’Hara is an American Mom, Wife, Entrepreneur, Community Leader and Advocate for Women experiencing fertility challenges. enter email to receive newsletter and book updates.